Researchers in Washington State are just like the rest of the misfits that call themselves wildlife biologists. Somehow they think that every animal they study needs one of these intrusive devices hung around its neck. Our Universities have produced a crop of researchers that are incompetent when out in the field and that rely on these tracking devices, because they cannot find the animals without one. I was watching a uncollared wolf dig up a coyote den in Yellowstone when a wolf researcher arrived and waved his antenna around a few times and then proceeded to climb back into his blue pickup. When I asked him if he was looking for wolves, he told me that there were none in the area as he had not gotten any signals from radio collars. I hope he was embarrassed when I pointed out the wolf sitting two hundred yards away in plain view on the hillside. This seems to be typical of the wildlife biologists I meet in our national parks. They are lost if you take away their radio-collars and antennas. Animals die from the stress of being chased and collared when their muscles break down and flood the kidneys with proteins from the damaged muscle. This is called Capture Myopathy. Macho B, the Jaguar killed by researchers in Arizona, had kidney failure after being snared and collared. Thirteen Iowa football players were hospitalized recently when they came down with the human version called Exertional Rhabdomyolysis. It is caused by the same thing. Lunatic football coaches push their players until the player's muscles break down and damage their kidneys. Kidney failure is certain without treatment. Lunatic wildlife researchers chase wolves with helicopters, capture Grizzlies and Jaguars in snare traps, and chase cougars with hounds until the wild animals suffer kidney damage in the the same way. Unfortunately, they don't get rushed to a hospital for treatment. They get entered in the researcher's report as having died from 'Unknown Causes." Any animal that dies within sixty days after being captured was probably killed by the researchers. 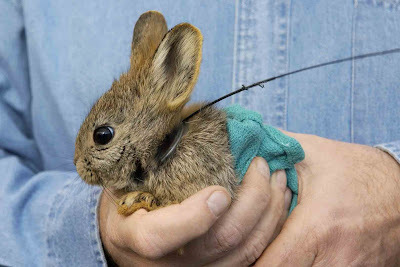 I fear for this Pygmy Rabbit. Thank you for this article, Larry. I've seen pygmy rabbit researchers flagging burrows and doing all kinds of things to reveal locations to predators, too. My first experience with radio-collars came forty years ago while working for the Idaho Fish and Game Department. We radio collared a captive Bighorn yearling ewe(She was imprinted on humans.) and it was my job to try to get her to take up with a herd of Bighorn ewes and lambs so we could track them. She would not have anything to do with other bighorns and would come running to me whenever she saw me. She died from our repeated attempts to reunite her with her kind. It left a lasting impression on me. Sacrificing these beautiful wild animals, just because radio collars are a convenient tool for researchers, is criminal. There are researchers out there who pay little regard to the well being of the animals they are dealing with, but on the whole they are caring individuals who don't like causing distress to them. Sometimes the data gained using radio collars is the only way, the data and information that is gathered is so important to the survival of many of these animals and others. Yes, sometimes there are casualties and this is regretful, but without understanding the dynamics of such creatures they are destined to certain death. It is often a game of odds, would you risk, a 20% chance of death in one animal, to save 50, 100, 500 or more of the same animal? I would. It may sound harsh but if we did not then they would all die, maybe not within 60 days, but some day, and then you would be criticising them for not doing anything about it. It is easy to stand on the outside and blame, you should try speaking to them and getting involved. P.S. Do you think holding the rabbit did it any good?